Would you like to add a tub of gumballs for your bank? Watch the coins drop into the gumball bank and a gumball roll down the chute. Great for a home, office, dorm or kid's room. Scratch-resistant translucent acrylic base and cap with a real glass globe stands about 11 inches tall. 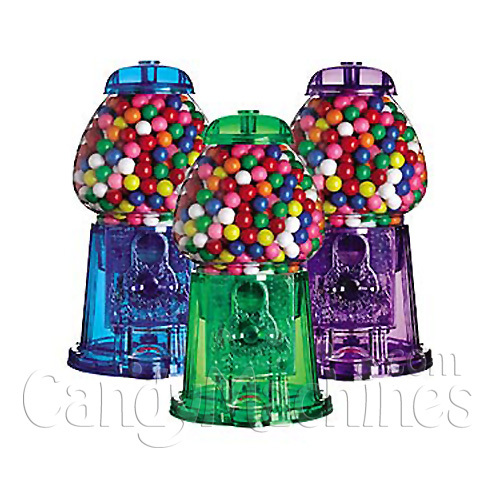 Holds 24 oz of candy or 1/2" Gumballs. One tub of Junior Gumballs fills this bank approximately 1 and 1/4 times. from Oakland Gift for son. I bought the blue one for my son this Christmas, I hope he likes it as much as I do because it is pretty cool!